This picture was made from the Christ Church study room, during a break from thesis writing. The sun emerged for a while from behind the clouds and the street and its buildings briefly assumed a surreal character, one which I thought would lend itself quite nicely to a high-dynamic-range (HDR) image. Five frames (two bracketed either side of the average exposure) went into the creation of this HDR image, allowing for the whole range of tones to be included in the final picture. I hadn’t employed this technique in quite a long time as, generally, I have departed from HDR imaging, so it was quite fun to play around with it again. 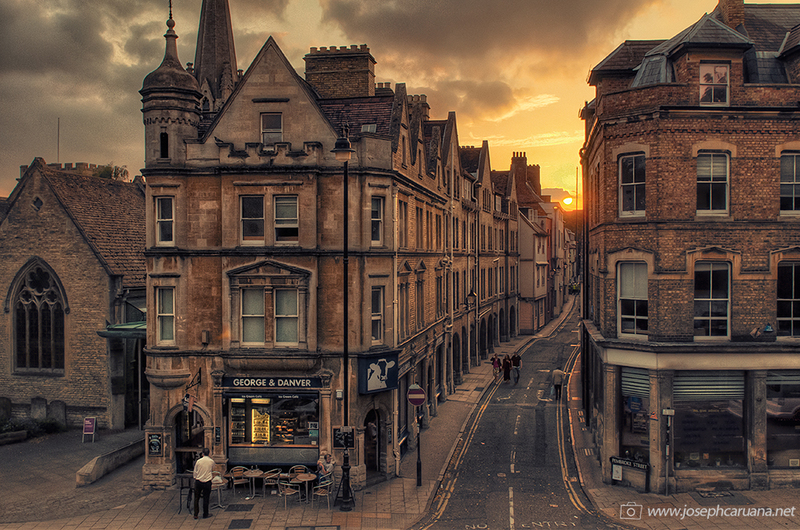 I have to say that I find myself looking at this picture with a sense of nostalgia as I recall the many evenings over the last three years when, whilst working at the very desk I’m at right now, I would cross this street to get a hot chocolate from that coffee shop in the corner, to keep spirits up. Anyway, enough rambling. I wish you all a good start to the week!